and developmental disabilities and their families. Donations play a very important role at the Hellenic Hope Center. We rely on them for the operation and expansion of our facilities and our programs. physical and developmental disabilities and their families. are treated with the respect and dignity to which every person is entitled. The idea for our organization was conceived in February 1999 when several mothers, of Hellenic descent with children with special needs, met to discuss the need for a support mechanism for themselves, their children and their families. Many other families also welcomed this idea and proceeded to formalize our organization. In June 2000, our organization was incorporated as a non-profit corporation. Members meet regularly to assess programs and services. 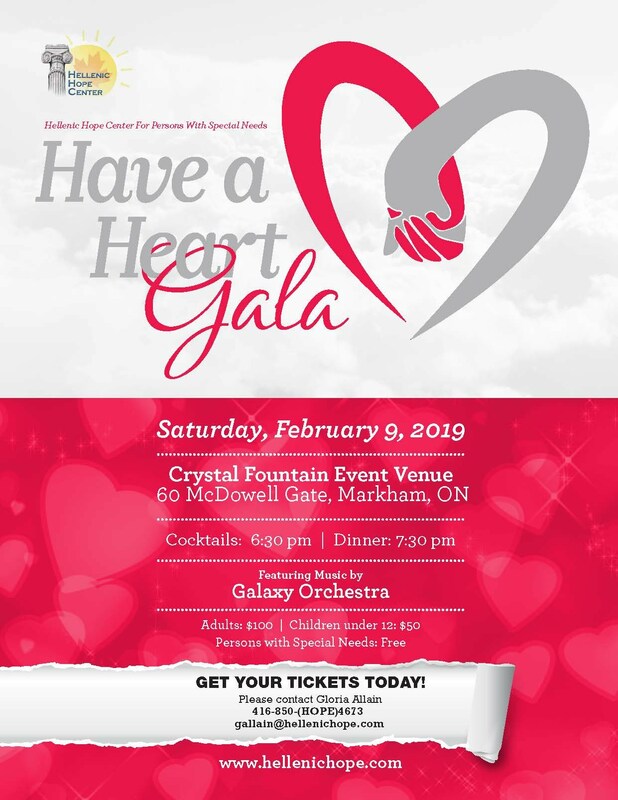 Have a Heart Gala 2019 Save the date for our annual fundraising gala to be held on Saturday, February 9, 2019 at Crystal Fountain. Showing 2 files from page Forms Online.